WAWARSING – Late last week it was announced by U.S. Senators Charles E. Schumer and Kirsten Gillibrand that the Joseph Y. Resnick Airport has been granted $211,486 in federal funding to improve airport lighting. The funding, part of the U.S. Department of Transportation's Federal Aviation Administration's (FAA) Airport Improvement Program, will pay 95 percent of the cost of rehabilitating runway and taxiway lighting, the airport's rotating beacon and the airport's wind cone. The grant is one of sixteen awarded recently to a dozen municipal airports in New York. The next-closest airport to earn a grant is Albany International, which was awarded $1,080,000. In 2009, the Resnick Airport operated 113 flights a week from its 3,838-feet-by-75-feet Runway 4/22 at 199 Airport Road, off of Route 209. Fewer than thirty planes are based out of the airport; however, for a small airport, it has often found favor with the feds. A $330,000 FAA grant was awarded in 2011 to acquire land west of the field, and for a taxiway. Joseph Y. Resnick Airport also received $963,119 from the U.S. Department of Transportation in 2007 for taxiway work. "I am pleased to add this federal investment to the list of 'arrivals' at Joseph Y. Resnick Airport," said Senator Schumer of the most recent grant. "We should always strive to achieve the highest standards of airline safety, and this funding will support that goal by improving airport lighting." "This is an important investment for Joseph Y. Resnick Airport and the Hudson Valley," Senator Gillibrand agreed. "Improving the airport's infrastructure can help provide better, safer service for travelers and businesses, and help strengthen the local economy." The Joseph Y. Resnick Airport was originally constructed in 1968, a few years after President Lyndon Baines Johnson visited Ellenville, taking a motorcade to and from Stewart Air Force Base in Orange County. Twenty years later, the Town of Wawarsing bought the 60-acre airport with federal and state assistance. It was named for Joseph Yale Resnick , an Ellenville native, World War II veteran and local business developer who was a Democratic member of the United States House of Representatives (New York's 28th Congressional district) from January 3, 1965, until January 3, 1969... and brought LBJ to town for the dedication of the new Ellenville Regional Hospital campus. According to the FAA website, the current Airport Improvement Program (AIP) was established by the Airport and Airway Improvement Act of 1982 (Public Law 97-248). It is funded by the Airport and Airway Trust fund, which is supported by user fees, fuel taxes, and other similar revenue sources. "This is an important grant for the Joseph Y. Resnick Airport which is operated by the Town of Wawarsing," said Wawarsing Town Supervisor Scott Carlsen. "The taxi way and runway lighting, as well as the rotating beacon and wind cone, have come to the end of their usefulness so this grant is critical for airport safety. I want to thank Senators Schumer and Gillibrand for their continued support, it is greatly appreciated." For years the airport has been known as a central site for flying lessons and headquarters for the region's hand gliding businesses, as well as a number of gliders. 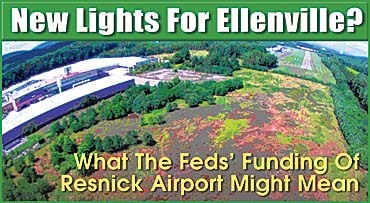 The advent of better night lighting on its runways has led some to start surmising that Resnick is now being poised for future development as a destination airport for the area, including possible use by clients at the Nevele Resort & Casino, should it get built in the coming years. The improvements are also but one of many good-news tidbits coming out of the area. The town and village building departments are becoming busier with new business applications and renovation permits for existing businesses. The autumn opening of Walmart, and that hoped-for casino at the former Nevele, has some residents and officials forecasting a future as bright as that airport beacon. "I thank Senator Schumer and Senator Gillibrand for this critical investment in the airport's infrastructure," noted Ulster County Executive Mike Hein. "The greater Ellenville area is prime for economic development and private sector investment and these much needed federal dollars will only enhance Wawarsing and Ellenville's potential for growth and continued revitalization."